All drivers should know something about hazardous materials. You must be able to recognize hazardous cargo, and you must know whether or not you can haul it without having a hazardous materials endorsement on your CDL license. Hazardous materials are products that pose a risk to health, safety, and property during transportation. See Figure 2.24. 2.24.2 – Why Are There Rules? Ensure safe drivers and equipment. To Contain the Product. Many hazardous products can injure or kill on contact. To protect drivers and others from contact, the rules tell shippers how to package safely. Similar rules tell drivers how to load, transport, and unload bulk tanks. These are containment rules. To Communicate the Risk. The shipper uses a shipping paper and diamond shaped hazard labels to warn dockworkers and drivers of the risk. On the driver’s seat when out of the vehicle. Placards are used to warn others of hazardous materials. Placards are signs put on the outside of a vehicle that identify the hazard class of the cargo. A placarded vehicle must have at least four identical placards. They are put on the front, rear, and both sides. Placards must be readable from all four directions. They must be at least 10 3/4 inches square, turned upright on a point, in a diamond shape. Cargo tanks and other bulk packaging display the identification number of their contents on placards or orange panels. Identification Numbers are a four digit code used by first responders to identify hazardous materials. An identification number may be used to identify more than one chemical on shipping papers. The identification number will be preceded by the letters “NA” or “UN.” The US DOT Emergency Response Guidebook (ERG) lists the chemicals and the identification numbers assigned to them. Not all vehicles carrying hazardous materials need to have placards. The rules about placards are given in Section 9 of this manual. You can drive a vehicle that carries hazardous materials if it does not require placards. If it requires placards, you cannot drive it unless your driver license has the hazardous materials endorsement. See Figure 2.25. The rules require all drivers of placarded vehicles to learn how to safely load and transport hazardous products. They must have a commercial driver license with the hazardous materials endorsement. To get the required endorsement, you must pass a written test on material found in Section 9 of this manual. A tank endorsement is required for certain vehicles that transport liquids or gases. The liquid or gas does not have to be a hazardous material. A tank endorsement is only required if your vehicle needs a Class A or B CDL and your vehicle has a permanently mounted cargo tank of any capacity; or your vehicle is carrying a portable tank with a capacity of 1,000 gallons or more. Drivers who need the hazardous materials endorsement must learn the placard rules. If you do not know if your vehicle needs placards, ask your employer. 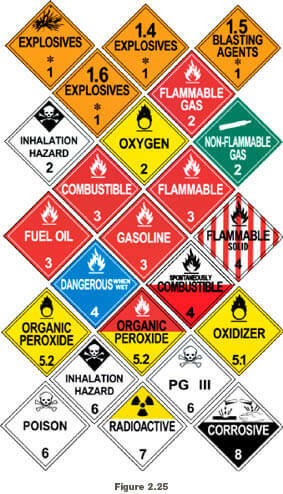 Never drive a vehicle needing placards unless you have the hazardous materials endorsement. To do so is a crime. When stopped, you will be cited and you will not be allowed to drive your truck. It will cost you time and money. 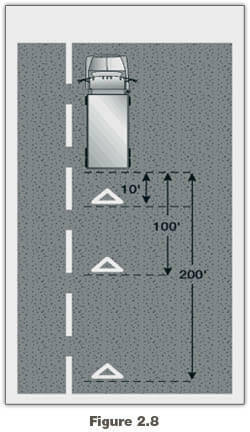 A failure to placard when needed may risk your life and others if you have an accident. Emergency help will not know of your hazardous cargo. Hazardous materials drivers must also know which products they can load together, and which they cannot. These rules are also in Section 9. Before loading a truck with more than one type of product, you must know if it is safe to load them together. If you do not know, ask your employer and consult the regulations.